Ready-made recombinant monoclonal anti-idiotypic antibodies, highly specific for the humanized antibody drug alemtuzumab (MabCampath, LEMTRADA). These inhibitory (Type 1) antibodies prevent the binding of the drug alemtuzumab to its target CD52, and can therefore be used to detect free drug. They are ideal as capture and detection reagents in pharmacokinetic (PK) bridging assays, and as a surrogate positive control in an anti-drug antibody (ADA) assay. Our recombinant, monoclonal antibodies are generated using the Human Combinatorial Antibody Library (HuCAL®) and CysDisplay®, a proprietary method of phage display, with guided selection methods to obtain highly targeted reagents. The result is highly specific and high affinity antibodies, ideal for development of PK assays. 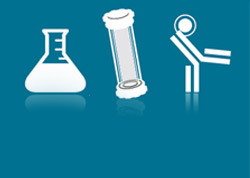 These fully human antibodies are also suitable as controls or calibrators for ADA assays.. The in vitro production of recombinant antibodies results in a consistent, secure supply of these critical reagents throughout preclinical development and clinical trials. Fig. 1. PK bridging ELISA using antibodies HCA198 and HCA175P. In figure 1, Anti-Alemtuzumab Antibody clone AbD19189 (HCA198) was coated on a microtiter plate at 1.0 µg/mL and left overnight. After washing and blocking with 5% BSA in PBST, alemtuzumab was spiked in 10% human serum and added in increasing concentrations as indicated. Detection was performed using HRP conjugated Anti-Alemtuzumab Antibody clone AbD16942_hIgG1 (HCA175P) at 4.0 µg/mL in HISPEC Assay Diluent plus QuantaBlu Fluorogenic Peroxidase Substrate. Fig. 2. ADA bridging ELISA using antibody HCA199. In figure 2, alemtuzumab was coated at 1.5 µg/mL on a microtiter plate overnight. After washing and blocking with 5% BSA in PBST, Anti-Alemtuzumab Antibody clone AbD19189_hIgG1 (HCA199) was added in PBST plus 10% human serum, at the given concentrations. Detection was performed by adding HRP conjugated alemtuzumab, at 4.0 µg/mL in HISPEC Assay Diluent, plus QuantaBlu Fluorogenic Peroxidase Substrate. HRP conjugation of alemtuzumab was performed using a LYNX Rapid HRP Antibody Conjugation Kit. Fig. 3. 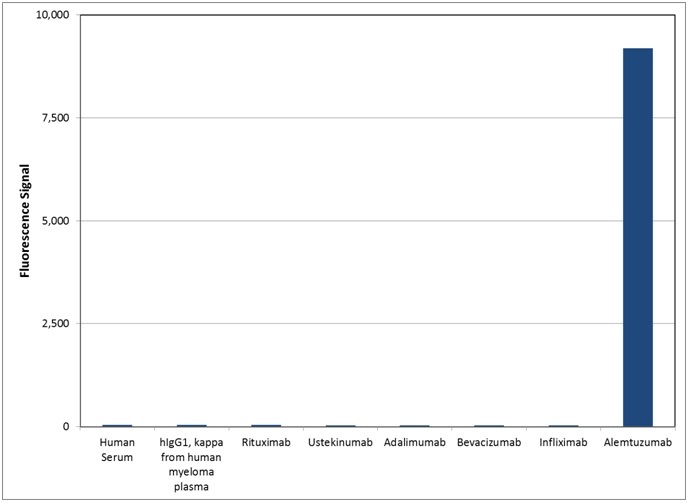 Specificity of Human Anti-Alemtuzumab Antibody HCA199. In figure 3, various antigens were coated at 5.0 µg/mL on a microtiter plate overnight. After washing and blocking with 5% BSA, Human Anti-Alemtuzumab Antibody clone AbD19189_hIgG1 (HCA199) was added at 2.0 µg/mL in HISPEC Assay Diluent. Detection was performed using Mouse Anti-Penta Histidine Tag:HRP Antibody (MCA5995P) plus QuantaBlu Fluorogenic Peroxidase Substrate.